Hollywood loves a comeback, almost as much as it loves pushing a particular mortal soul renowned for acting (sometimes) to the top of pile in order to lavish him with exhaustive praise and an abundance of lead parts, that is until the next flavour of the month comes along with a paper bag on his head and quotes Eric Cantona. The current sacrosanct actor impervious to criticism and avoidance is that handsome devil Matthew McConaughey, rather than being an unjust champion of audiences, directors and critics the Texan native is a worthy flavour of the month mainly down to his quality laden, and prolific, last three years of films. Written off as banal Rom-Com lead in his early years due to appearances in Ghosts of Girlfriends Past, Failure to Launch, The Wedding Planner and, of course, How to Lose a Guy in 10 Days, yet McConaughey has taken a firm grip of his destiny to be Hollywood’s premier renaissance man, you could say cinema has been witness to McConaissance (pat on the back to whoever came up with that). In build up to his latest film, Dallas Buyers Club, McConaughey has excelled in an eclectic mix of performances- as a calmly unhinged hitman partial to fried chicken in Killer Joe, a runaway outcast in Mud and most recently almost stole the show in The Wolf of Wall Street with his comically genius cameo as DiCaprio’s stock market mentor. 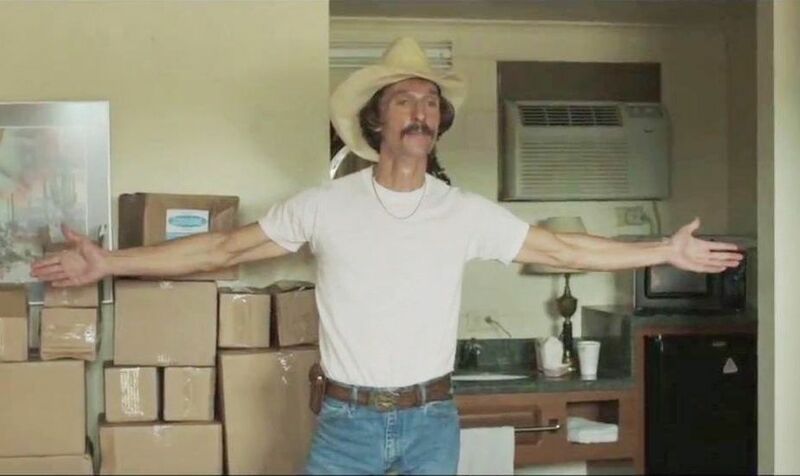 Taking his acting to the next level McConaughey has shed the pounds for his role as AIDS victim Ron Woodroof, disfiguring his once rippled torso to something that uncomfortably resembles the deprived state of a concentration camp prisoner. Once again delving into serious high class drama the Dallas Buyers Club examines the 1980s AIDS epidemic from the view of uncompromisingly virile Texan Ron Woodroof and the insular, conservative society he’s embedded in. Jack of all trades, Woodroof wheels and deals his way through life with little regard for himself or anyone else, that’s until the bombshell that he’s contracted AIDS and handed a death sentence within the month. Brusque and riddled with denial over his condition Woodroof sets out to defy the doctors and prove there “ain’t nothing out there can kill Ron Woodroof in 30 days”. A fortuitous meeting with an unlicensed doctor in Mexico saves Woodroof from accidently poisoning himself with overly aggressive trial drug AZT, a new concoction of pills and supplements from below the boarder improve his condition but his new remedy is unapproved in the USA. Woodroof’s campaign to legalise his natural(ish) cure and ban the harmful AZT comes in the form of ‘buyer’s club’ that illegally supplies the wonder cure to infected, mostly gay, population. With little tolerance or interpersonal skills amongst the gay community he begrudgingly enlists the help of HIV positive transvestite Rayon (Jared Leto). What’s remarkably unremarkable about Dallas Buyers Club is how straightforward a film it is, void of any fancy thrills and frills we’re left with an earnest drama unaltered or influenced by the director Jean-Marc Vallée, It’s almost a harken back to the days pre dating the Cahiers du cinéma’s proposal of the director as an auteur. Unlike Oscar rival 12 Years A Slave, Dallas Buyers Club has little sign of an artistic direction, perhaps that in itself is auteurist. With little experimentation with the camera it’s a relief that McConaughey and Leto produce a couple of engrossing performances punctuated by a composed balance of power and tenderness required of the subject matter. Woodroof’s epiphany and reinvention/redemption is comparable with A Christmas Carol’s Scrooge, rather than renouncing his humbug feelings about the festive period, Woodroof renounces his a bigoted past at the rodeo for an altruistic crusade to help those in his position, including the gay community which his peers and former self would stare down upon with disdain. The stereotypical redneck setting of Texas sets the narrative and McConaughey up for a solid story of reprisal and acceptance of others under the unique and sombre banner of the AIDS epidemic; references to Rock Hudson as a high profile victim along with Woodroof belief only “faggots” can get the disease dually sets the period’s tone as well as an intriguing angle on the subject from the ultimate outsider perspective in the form of rodeo rider Woodroof. Bar being unnervingly thin, McConaughey excels in his transforming role as both insular chauvinist and latterly as a selfless AIDS campaigner; additionally his bouts of worsening condition in the film are as achingly real as his weight loss. 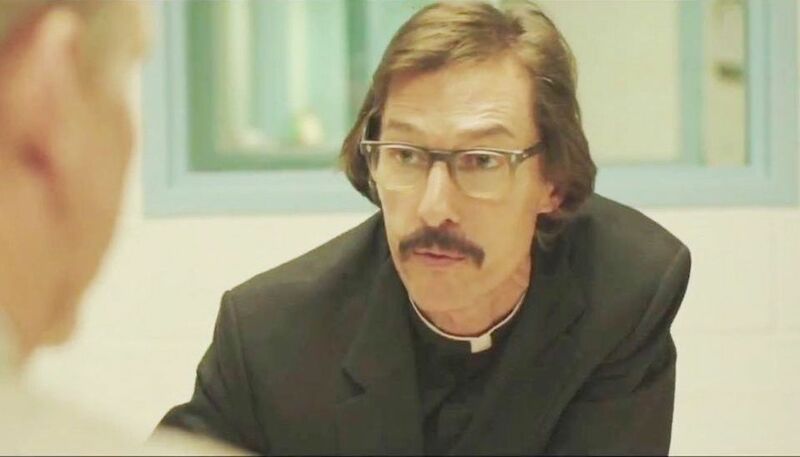 It’s the perfect role for McConaughey, his natural Texan mannerisms are allowed to breath to give his cocksure character an authentic charm that gives off a whiff of the ruminative James Stewart. McConaughey carries proceedings for the most part, making the most of an obligatory insipid romance with sympathetic doctor Eve (Jennifer Garner), but it’s the Oscar nominated support of Jared Leto who brightens up the film aesthetically and emotionally. Transvestite Rayon is a perfect other half for the film’s odd couple, despite some maudlin convergence the duo are superb paradoxes together. Leto’s ability to omit an androgynous appearance and organic gestures make him entirely convincing, at times you’ll be rudely reminded he’s not a woman at all. In contrast to Woodroof, Rayon is flamboyantly open emotionally, providing a rich intensity that, while underutilised and somewhat clichéd, is a large contributor to the film’s success. Dallas Buyers Club echoes last year’s extravagantly brilliant Behind the Candelabra, not because of the narrative similarities, but the brand of high quality drama uninterrupted by excessive effects or camera angles, allowing the talented actors to shine best. 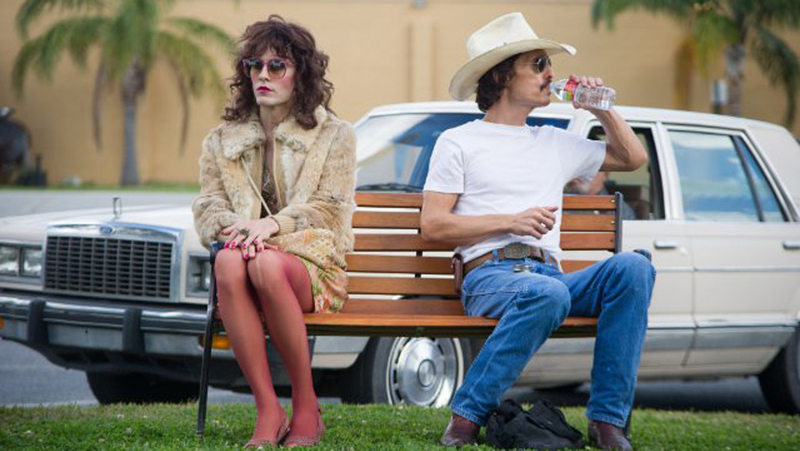 McConaughey and Leto oblige, making something memorable out of a competent but jittery plot that would have profited from depth over breadth, nevertheless Dallas Buyers Club restores the belief that films don’t have to be spectacles of outlandish nonsense, quality drama can illicit all the desirable qualities that makes cinema special.